MADE is your favorite destination for unique handmade jewelry and expert on-site jewelry services. Art Jewelry is the name given to jewelry that emphasizes creative expression and design, and is characterized by the use of a variety of materials. At MADE, customers can expect to find high quality, handcrafted jewelry that features unusual combinations of oxidized and polished sterling silver, 14k gold, semi-precious and precious stones like amethyst, ruby, sapphire onyx, pearl, labradorite, marble and jade. In addition to sales, MADE is also full service jewelry store that offers expert onsite jewelry repair and custom design. 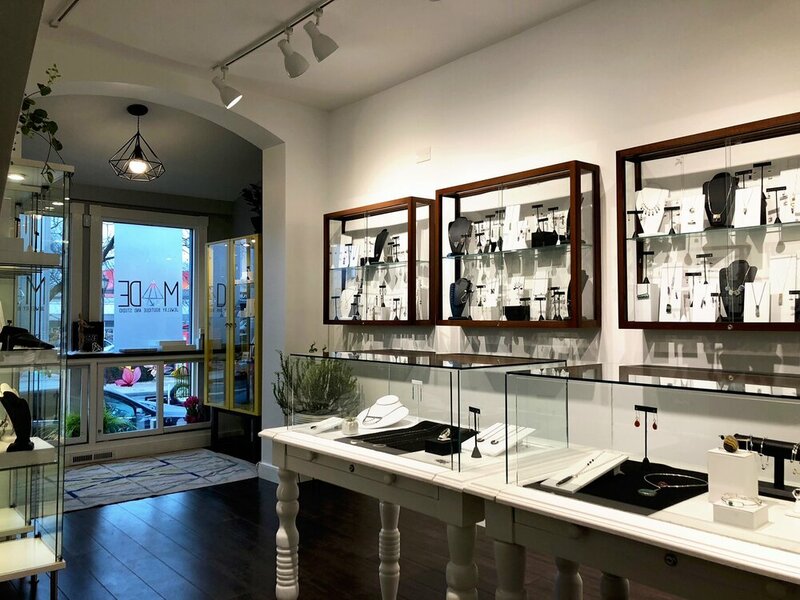 MADE Jewelry Boutique & Studio is owned and operated by art jewelry designer Chrissy Cook, who is committed to using responsible and ethical jewelry manufacturing practices and is equally committed to promoting jewelry artists who aspire to the same ethical standards. MADE offers a carefully curated selection of handmade designer jewelry including Chrissy's own one of a kind and limited edition line of sterling silver jewelry.